ST. PETERSBURG. 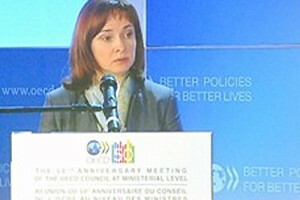 July 13 (Interfax) – Government policy regarding the development of infrastructure, logistics and competition on food markets, as well as tariff regulation could help to reduce the volatility of prices and lower inflation expectations, Central Bank chief Elvira Nabiullina said at the International Financial Congress. “We need to fight not only with the consequences of shocks for inflation, but also with their reasons. These reasons are often found beyond the influence of the Central Bank, but this does not mean that we can’t find adequate measures of government policy in general. This concerns, foremost, the dynamics of food inflation and regulated prices and tariffs. Government policy on the development of infrastructure and logistics, competition on markets, foremost food, and tariff regulation of natural monopolies could make a substantial contribution to reducing the volatility of prices, and thus lead to the faster reduction of inflation expectations,” Nabiullina said. This would enable the Central Bank to more quickly bring the key interest rate to a balanced-neutral level, that is, 2.5%-3% in real terms, or 6.5%-7% in nominal terms, she said. The emphasis in the Central Bank’s policy in the next five years will gradually shift from achieving a target for inflation and lowering inflation expectations to keeping inflation close to the target and holding inflation expectations at a low, anchored level. Nabiullina said that inflation is a monetary phenomenon and its average level depends on monetary policy. “Average inflation will be close to 4%. But, of course, it will fluctuate. And fluctuations of inflation around the average could be of various nature, variously influence inflation expectations and through them monetary inflation,” she said. In conditions of high price volatility, hasty reactions to shocks, both positive and negative, should be avoided, she said. “Such a policy makes it possible to prevent ‘jerks,'” Nabiullina said. For example, if the Central Bank had lowered its interest rate faster in line with the faster slowdown of inflation at the beginning of the year, as many wanted, then very soon it would have had to raise the rate due to the acceleration of price growth, she said. “However, there are also sometimes shocks, as was the case in 2014, to which we need to respond decisively,” Nabiullina added.